I was there on an early dining package menu with a group of girlfriends (three courses and a glass of kir royale for £26) and my first pleasant surprise was that this isn’t one of those places where those on a “deal” are treated as subordinate to the a la carte customers (I’m glaring at you L’Autre Pied). All the dishes are on their a la carte menu as well so these aren’t “specials” using cheaper/ left over ingredients, you are getting the real McCoy. As soon as you enter there is no question whatsoever as to the nationality of the food on offer. Dark wooden floors and wall panelling punctuated by mirrors along with startched white table cloths and wooden bamboo back chairs are unmistakably Gallic. Service is of the old school French variety minus the sterotypical rudeness, in fact all the waiters are rather lovely. The food on offer cannot be described as unusual or imaginative. What it is, however, is traditional food cooked and presented well. Very well in fact. 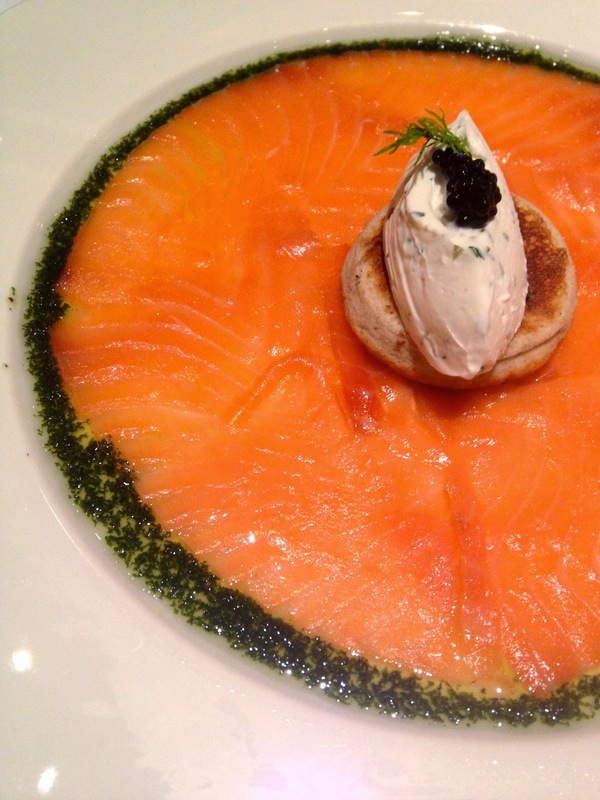 Most of our group kicked off with a plate of the thinnest most delicate slices of cured smoked salmon, edged with a dill-dominated herb pesto and topped with blinis and a quenelle of fromage blanc. 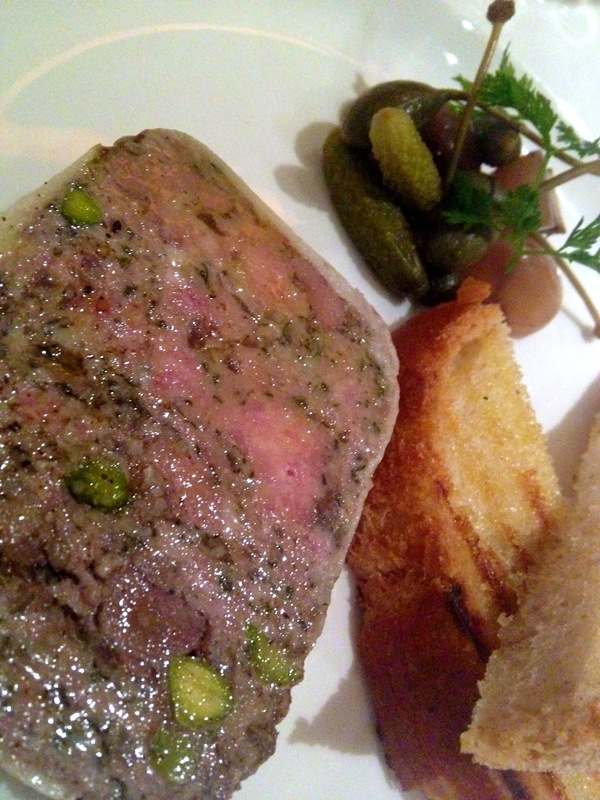 I opted for ham hock terrine. One of those deceptively simple French dishes where one can look no different to the next but the flavour varies greatly. This one was well seasoned with a welcome crunch of texture from pistachio nuts. Pickled baby onions and cornichons helped cut through any greasiness from the meat. No complaints here. The smoothest pomme puree you can find (replete with copious butter and cream no doubt!) was a rich foil to a caramelised crusted calve’s liver with onions and Alsace bacon which I’m told was a complete winner although a very large portion for something so rich (but better too much than too little in my opinion). I’ve never quite managed to get to grips with liver so went for the vegetarian option; Norfolk asparagus with a poached Burford egg on a bed of polenta. The polenta was unfortunately seemingly completely unseasoned and needed a good dose of pepper as well as some salt, despite the parmesan shavings. 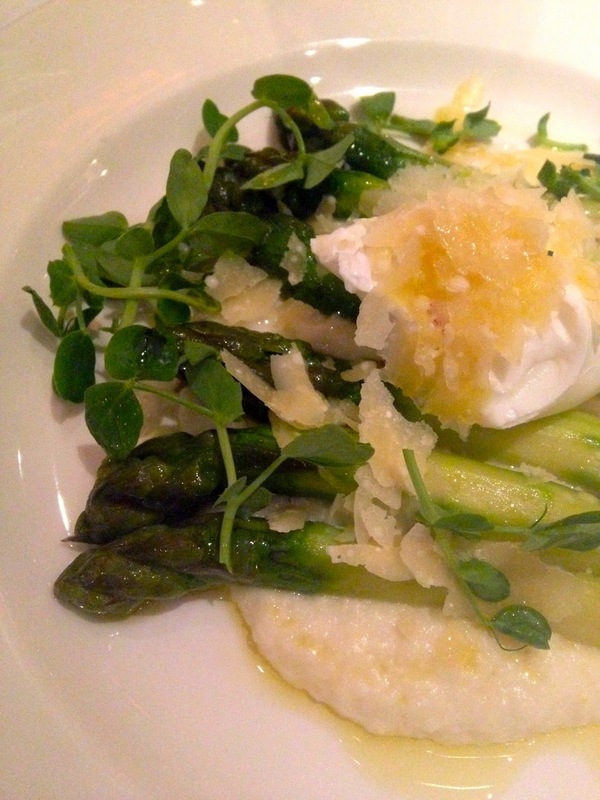 The asparagus was a thing of perfection though, the woody, chewy bits peeled away and asparagus cooked to soft but not floppy topped with a soft orange yolked egg popped open to ooze over the asparagus. The wine list was decent with plenty of options at all price points and we plumped for a perfectly quaffable Picpoul de Pinet at £26. GBdL are justly very proud of their tarte tatin, the apples a dark, rich brown with caramel topped off with a sweet, crispy, pastry base (no soggy bottoms here). It was definitely one to rival the best that I have eaten. 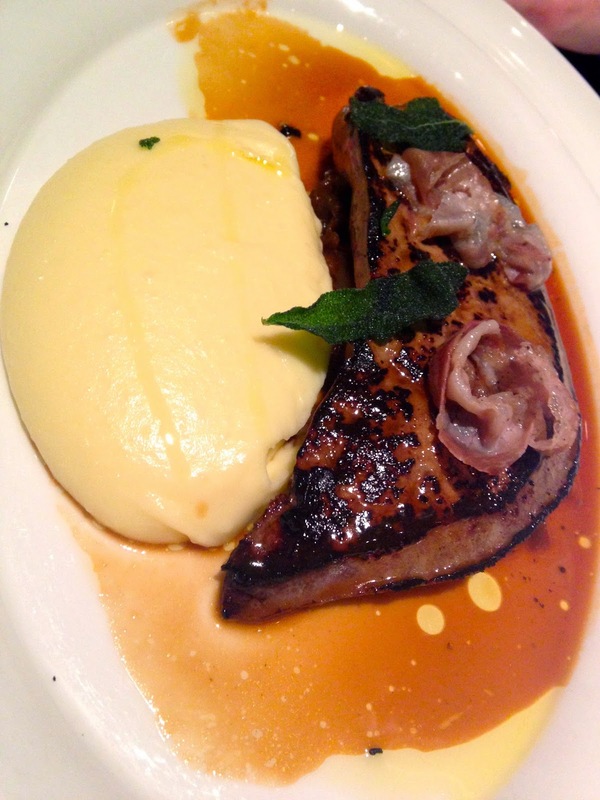 It wasn’t all perfect (see polenta above) but in general it was a well executed bistro menu. Main courses are in the mid twenties a la carte and desserts £6.50- £8.50 so its the upper end of mid range for a bistro. I suspect that there is an element of resting on their laurels though. Many of the accolades on their website and the certificates lining the corridors leading to the toilet are several years old. 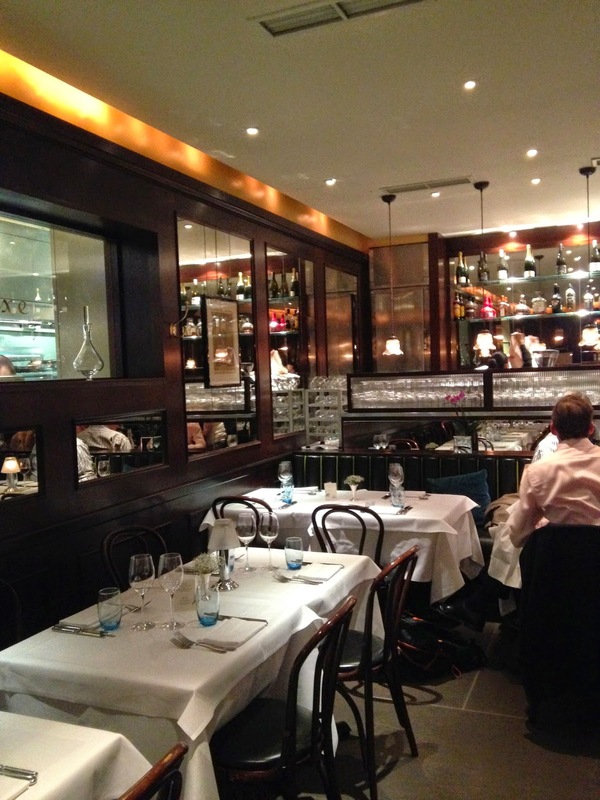 There are also a good deal more french bistro/brasserie type venues that have sprung up since many of the original reviews of GBdL (Zedel, Chavot, Little Social to name but a few). That said, if you want good, traditional French brasserie food done well in the Baker Street area then you can do much worse.